In January, Gmail's Product Manager Todd Jackson said that Gmail will include a contact deduplicator. "Jackson says a de-duper is on the way and that contacts will have more of a presence both in your inbox and in conversations." 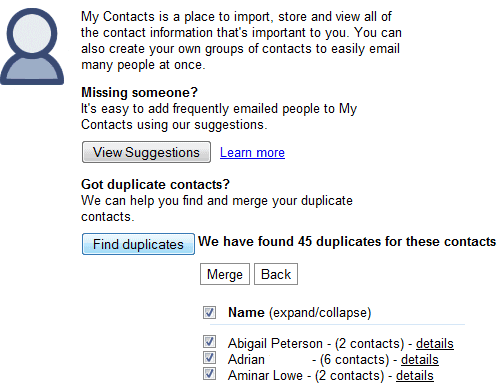 11 months later, Gmail added a feature that detects and merges duplicate contacts. "To clean up your contact list in one fell swoop, just click the Find duplicates button in the contact manager, review the merge suggestions (and uncheck any suggestions you don't want merged), and hit the Merge button." If you have many contacts, it's a good idea to consolidate them and to have a single contact for each person. Other popular webmail services included this feature a long time ago: Yahoo Mail and Hotmail added tools for cleaning up duplicate contacts in 2007. Do not use this feature if you use gtalk! After I reviewed proposed merges and clicked "Merge", all these contact were removed from gtalk! Some smartypants programmed merge so that JIDs were converted to plain emails. Thanks Google system, very nice feature. I found many duplicates that I didn't know were there! Not good enough. Need to be able to sync/merge across multiple Google Contacts lists. At contacts.google.com, I have two lists - one for my gmail, one for my non-gmail (used on Google Voice) and then one for my Google Apps address. I need to be able to keep them in sync, or define where my contacts are so that I can use one list instead of three. Google should disable this "add every mail receipient automatically to your address book". It's more than disturbing. Even when they are not added to "Contacts", they are still in the contact manager. EVERY other contact manager doesn't have this absurd "feature" (i call it mistake!). Feature is half-baked as it doesn't let you step through all the duplicate sets to determine which information to keep from each set. I have over 2500 contacts and 150+ were duplicates. This feature was extremely helpful and eliminated the duplicates quickly. When I try to merge, it just goes onto overload. I managed to merge about 5000 but still have many dups. I'm sure I've done something, but the 9k will be back tomorrow.. Same problem. I now have 9800 contacts with as many as 18 duplicates for each entry. I am having to manually delete duplicates because the "find and Merge" command is no longer working with the magnitude of the task. I now get "error 101" and multiple retries that do nothing. Same issue here and can't merge as i Get Error 101! Help! I have experienced the same thing before; I suggest you can try using duplicate remover like Scrubly Duplicate Remover. This works well for me. I assure you this will end up you’re duplication’s problem. Scrubly is "bait and switch". Once it's done going through your address book, it asks if you want the newly scrubbed list of contacts (which is on their server) added to your address book. After waiting 40 minutes while it diligently "scrubbed", they want you to have a premium sub. before you can download the scrubbed data to your computer. Best avoided,if you're seeking a free solution! does the scrubby thing work.. i have 26000 entries and all are dups except about 350! I have over 5000 contacts and I sync them with my iphone. I find duplicates and merge them, and a few hours later i have over 1000 duplicates again !!! Even if I delete all of them from the iphone, and then load them back, it happens again and again. I encountered similar problem that this program could not run to clear and merge my 9700 contacts.The program came out with the #101 message. Any suggestion to help? Thanks. Had the same issue with 21463 contacts. signed up with scrubly.com i end up with 633 contacts from Gmail. Despite if you need just only several specific features, scurbly may work well.